The Media Review Network has arranged a meeting between its Executive Member Dr. Firoz Osman and the leader of Hamas’ Political Bureau Khalid Meshaal. 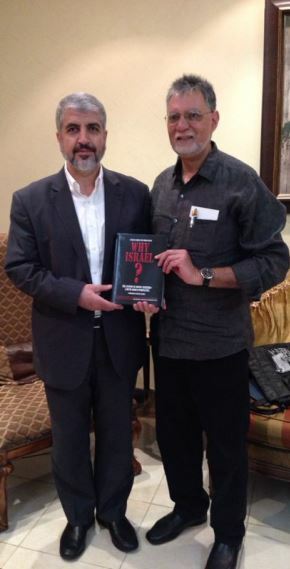 Osman who is also Co-author of MRN’s highly rated publication “Why Israel?” is in Qatar where he is engaged in discussions with Meshaal and other senior members, including Osama Hamdan. The current engagement follows Israel’s bloody carnage and devastation caused in Gaza which Hamas alongside Islamic Jihad and other factions of Palestine’s liberation movements successfully resisted. Since the 2006 elections which saw Hamas emerge victorious over Fatah, Israel has connived with America and other regional actors to marginalise the movement and punish Palestinians for casting their votes for it. MRN is keenly aware that this sinister campaign is directed to silence Palestinian voices. It knows from its own experiences in South Africa the lengths former apartheid regime went to clamp voices of the oppressed. Bannings and detentions were the order of the day as indeed is the unfortunate reality facing Palestinians at the hands of Apartheid Israel. Hamas being in the forefront leading resistance to Israeli state terrorism and carrying the responsibility of articulating the aspirations of Palestinians cannot be allowed to be criminalised as a terror outfit. As an advocacy and research unit, the Media Review Network has a firm position on the legitimacy of Hamas. The current round of discussions between Dr Osman and Khaled Meshaal is a continuation of earlier engagements. We are committed to supporting Palestine’s freedom struggle and reaching out to Hamas as a key component of that noble quest allows us to analyse and interpret their policy positions with greater degree of understanding. The article in the Business Day 15th April 2019 Airstrikes on Pakistan ‘show nuclear war is not a threat’ refers.